India 24 November 2016: One of the most popular Bengali vegetarian street food is “Mochar Chop”. “Mocha” in Bengali is the local name for banana blossoms. Mochar Chop or banana blossom cutlets are one of the best Bengali street foods, and you should definitely make it at home. It is a snack recipe made up of Mochar ( banana flower).For Kids this recipe is perfect who do not like to have usual Mochar curry If you are a non vegetarian then let me tell you that these croquettes feels like you are eating something close to a pulled-mutton kebab which has evolved from kitchen to kitchen. Mochar Chops taste the best when they are made using the ratio of three parts of boiled and strained banana flowers to a little less than two parts of mashed boiled potatoes. This ratio will make sure you get a lot more of banana flowers in each bite, than mashed potatoes. Making Mochar Chop at home requires a lot of patience. But all the patience, is totally worth it. Mochar chop have a unique taste which is a little sweet taste coming from the banana blossoms, amazing spicy flavor coming from homemade garam masala which is known as “bhaja moshla” in bengali, which gives mochar chop it’s Bengali touch. Bhaja moshla recipe used for making Mochar chop : Roast 1 tbsp cumin seeds, 1 one-inch cinnamon stick, 4 green cardamoms, 6 cloves and one dried red chilli, until all these spices are nice and fragrant. Now using a grinder, grind these spices to a very fine powder and store this Bhaja Moshla in an airtight container. 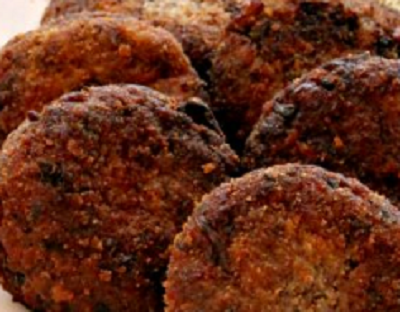 As I said that you need a lot of patience to make the perfect mochar chops, so you need to do the first two time-consuming steps a day before, so that you are not overwhelmed with the amount of time it takes. On the first day start with taking out the outermost red cover of the banana flower. ONce you remove that you will see a group of florets which you will be using to make mochar chops. Now start separating all the florets. Make sure you discard all the thick red petals. The petals near the core of the blossom become interlocked, hence we will chop off the whole little cone very finely. Also chop the florets you separated earlier, but make sure to remove the hard stick and the transparent polythene-like part from each floret. Soak these finely chopped flowers in a dish of water with salt and turmeric powder for at least three hours. Soaking the flowers helps in removing the bitter taste from the blossoms. Discard this water and transfer the banana flowers to a pressure cooker with some water and 1 tsp of salt. Cook them till three whistles on a low flame.Make sure you don’t overcook the blossoms, just cook them till they’re a little soft to chew. Now strain the blossoms out of the cooker and squeeze out the water completely from the banana blossoms. After squeezing, the water out, mash the blossoms a little with your hand or you can use a spoon for the same. Keep the mashed banana blossoms in the refrigerator. On the next day, take the cooked flowers and mix it with the boiled and mashed potatoes. To this add the finely chopped chillies, roasted peanuts, grated coconut, ginger paste, sugar, lightly fried raisins, cornflour, sugar, salt and the homemade bhaja moshla that we saw earlier. Mix all ingredients lightly to form a dough. In a pan heat 2 tbsp of oil and fry the onions till they turn golden-brown. Now add the dough to the onions and Cook it for around five minutes. Let this cooked dough cool down and come to room temperature. Now knead this dough very lightly. Make sure to taste the dough to see if you need to adjust salt or sugar. The dough should taste slightly sweet. 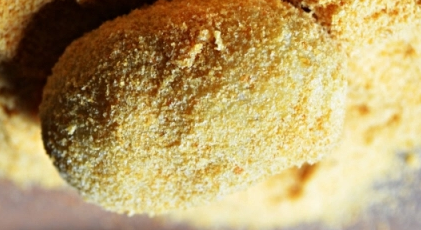 Using your hands make flat discs from the dough and roll them in breadcrumbs to coat them. Now in a wok heat oil for deep-frying the croquettes. Once the oil heats up reduce the flame to medium and deep-fry the chops, till golden on both sides. Use a perforated spoon to remove the Mochar chops onto an absorbent paper. These chops go well with tomato sauce and alfalfa sprouts.. Sometimes while frying the chops they might tend to disintegrate so always keep some extra boiled and mashed potatoes at hand while making the chops. This happens because there is still some water present in the boiled banana flowers which didn’t get squeezed out, hence always make sure to squeeze out all the water from the blossoms. If the chops disintegrate quickly add more boiled potatoes to the dough to solve the problem instantly. 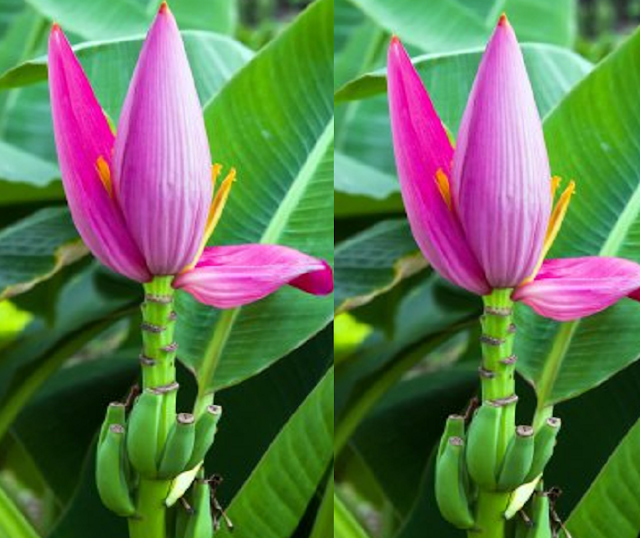 Banana flowers are rich in iron hence, Always wear gloves while cleaning the banana blossoms, as they tend to blacken your nails.